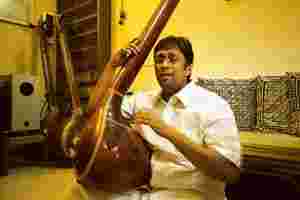 Chennai: Once or twice a month, depending upon his schedule, Sanjay Subrahmanyan leaves his apartment and walks over to a recording studio just across the street. But Subrahmanyan, an eminent Carnatic music vocalist, is not there to sing—is not there, in other words, to do what one would expect him to do in a studio. Instead, he sits at his microphone to talk and to interview guests, creating podcasts for The Sanjay Subrahmanyan Show (Sanjaysub.libsyn.com), which is also hosted on his blog (Sanjaysub.blogspot.com). These projects, many of them firsts for the classical arts in India, have emerged in various guises: Subrahmanyan’s podcasts, blogs by musicians as well as listeners, Wiki-enabled databases of lyrics, tutorials on Skype, Facebook communities, online transliteration tools and notation typesetters, and Twitter feeds. Subrahmanyan himself was one of the vanguards of Carnatic music in the age of Web 1.0. With a partner, he set up Sangeetham.com, a hugely popular website, with always-buzzing forums, that nevertheless imploded when it became a victim of the dotcom bust. “We weren’t running it as a profit centre at all, which was the real problem," Subrahmanyan says. “After Sangeetham closed, I was inactive online for four years or so, but the recent Web 2.0 concepts really started to intrigue me." He wasn’t the only one; at least four other musicians have recently started blogs, although they are updated with varying degrees of ardour. “When Carnatic musicians began to tour overseas regularly, they started to see how Western musicians were getting out of their shell and reaching out to the world through these mediums," says Sikkil Gurucharan, a vocalist whose blog is dormant but on the cusp of being relaunched. “Also, in a sense, musicians earlier were separate from their audiences, but that gap has now narrowed." Subrahmanyan was drawn in particular to the format of the podcast after he downloaded and listened to numerous episodes of other shows. “I’d listen to podcasts on board games, and the technology podcasts of Leo Laporte," he says. Every episode of Subrahmanyan’s own chatty, freewheeling show, on average, is now downloaded 800-1,000 times, by listeners in India but also in the US and other countries. Indeed, the constituents of the south Indian diaspora, many of them cut off from the classical music that they grew up with and love, are the primary progenitors of these innovations; unsurprisingly, a large number of them are computer programmers in the US. A sterling case in point is Ramadorai Arun Kumar, a Chicago-based computer engineer who is now in Chennai for the music season. Last year, over a couple of months, Arun Kumar put together a piece of Unicode software to transliterate lyrics in one language into any of six other languages. Perhaps looking for a keener challenge, he then spent many weekends and late nights developing an automated system to notate music. “I think a lot of us take pride in the fact that Carnatic music is very ordered and very scientific, so maybe that culture itself acts as a catalyst for people to do something along these lines," says Arun Kumar. “In a Hindustani music forum, I once asked about similar systems, but there was a very weak level of interest." Inevitably, these projects turn out to be collaborative. Arun Kumar enlisted the help of other members of a Carnatic music forum to work on the languages he did not know. Sunil Mudambi and Sai Prasad Viswanathan, young professionals living in Singapore and the US, built an extensive audio database of 725 songs of the 19th century composer Tyagaraja, without ever having met each other. “Tyagaraja composed thousands of songs, but we have an existing list of 800, and we hear only 200-odd sung in concerts today," says Mudambi. “If that trend continues, we may just lose the remaining songs. The idea of the website is to propagate the entirety of his compositions." Simultaneously, Viswanathan worked with a dozen people across the world on a Wiki that compiled the lyrics and explanations to more than 400 songs of another composer, Muthuswami Dikshitar. “When we started, we’d have over 100 edits daily, but now it’s slowed down to once a week or so," he says. “We’ve begun to get a lot of emails from people who say they’re using the lyrics to teach or learn the music." In a pleasant twist, these endeavours can sometimes become the listener’s way of giving back to the musician. “Every time I search for lyrics with Google, I get results from these databases that are accurate eight times out of 10," says Gurucharan. “And it’s always great to go online and see all these forums where people are actively discussing Carnatic music, wanting to learn more about it." This is the second of a series on Chennai’s music season. The first part was on bootleg audience-recorded versions of concerts, courtesy small MP3 recorders. Next: The little company that could.